With a strong emphasis on graphical exercises and clear, relevant examples to illustrate concepts along the way, Engineering Design and Visualization is the ideal resource for learning engineering design and visualization. Logically structured and organized into 10 chapters that reflect the natural progression of topics, from basic to more complex, the book gives special attention to three-dimensional visualization. 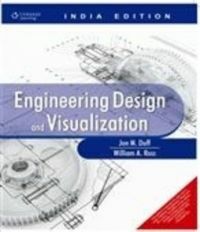 It is the perfect standalone guide and also a valuable supplement to any other CAD or graphics book, designed to greatly enhance the learning experience of anyone seeking a more in-depth understanding of sketching for engineering design visualization.